The Short Version: The web’s creative abbreviated language can sometimes be bewildering to newcomers (aka n00bs) because online convos make their own rules, which are constantly evolving and shaped by youth culture. If you find yourself frequently stumped by messages like “ur gr8 wanna d8?” and “luv u bae,” you can get fast and succinct translations using Slangit. This free online dictionary keeps up with the latest lingo so online daters can keep their flirting on fleek via text, chat, social media, and other online channels. The website defines over 5,000 common abbreviations, acronyms, and emoticons, drawing from user feedback to accurately explain the meaning of unique terms like MIRL (meet in real life) and 143 (I love you). Slangit’s extensive definitions and straightforward tools help online daters stay savvy and safe while messaging potential bf/gfs. In middle school, my crush and I were chatting via instant messenger when he asked, “Wanna be my gf?” I froze. GF? Did that mean what I thought it did? What were the odds he was asking me to be his “good friend” or “group favorite” or.. “gullible fool,” and I’d embarrass myself by being too forward? A quick web search put my worries at ease. He was asking me to be his girlfriend! I hit the caps-lock button and typed back, “YES.” Just like that, I’d gotten my first bf. Understanding what your date is saying is pretty important to your romantic success, but that can sometimes be a challenge on the web with so much new and confusing slang leading ppl 2 go wtf! Luckily, there are online resources made to fill you in on what kids today are saying. Founder of Slangit, TechTerms, and FileInfo, Per Christensson, has been building websites since 1999 to help users better navigate the web. In 2006, he launched ChatSlang, which is now called Slangit, as a free slang dictionary for anyone befuddled by their BFF or wooing their WUB over text or chat. Today, over a decade later, Per heads up a small team committed to simplifying leetspeak, netiquette, tech jargon, and online slang for people of all ages. On Slangit, easy-to-use search functions comb through more than 5,000 terms and offer you a complete definition of slang like yolo, swag, hipster, selfie, and creeper. If a specific word or phrase isn’t already in Slangit’s bank, you can suggest a new slang term for the site’s expert contributor to define. Slangit welcomes user feedback to keep its database up to date with the latest trends. Taking you from WDYM (what do you mean) to IKWUM (I know what you mean), Slangit gives singles and couples the tools to communicate clearly and flirtatiously using the most current terminology on the web. Slangit organizes slang terms by category for easier browsing, and users can sort by popularity to see the most commonly used acronyms, abbreviations, and emoticons. In total, Per’s websites see over 65,000 visits a day by people looking to learn the meaning behind popular internet terminology. Whether your crush is contacting you via text message, social media, online chat, web forums, or online gaming, Slangit compiles the need-to-know terms used on a wide range of social spaces. By studying this resource, you can increase your baller vocabulary and become a conversational beast in any setting. Slangit defines many important terms for daters, including promposal, sexting, and ghosting. You can search for emoticons, too, in case you’re not sure what your crush means by making faces at you. I knew a guy in college, for example, who constantly sent a looking-sidelong face (>.>) in a teasing yet confusing way. According to Slangit, this face can be used as a stealthy expression. The guy I knew was definitely stealthy. In the span of two months, he asked out three of my friends (and me) in close succession. To this day, I still associate that face with shifty daters. Slangit helps daters see into the heart of their crush’s meaning and communicate their affection (LYL) or approval (Yasss) online. On Slangit, you can find niche resources to meet your specific social needs. Whether you’re a gamer or forum regular, you can look up all the terms you’re likely to come across by referencing the site’s extensive categories. 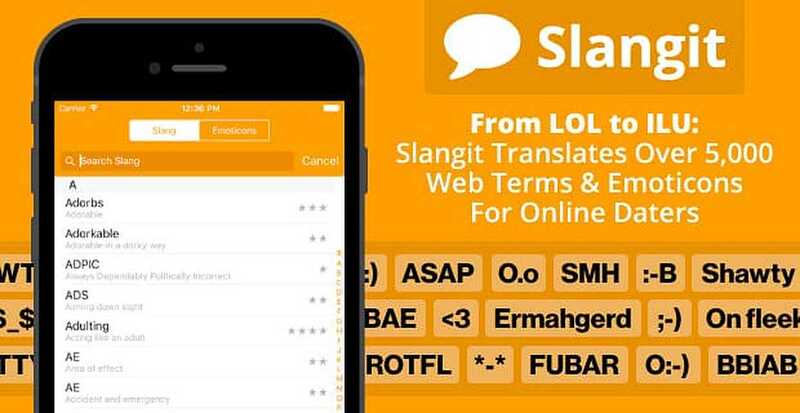 Slangit offers catered lists compiling the most popular internet slang used on online chat, text messaging, web forums, and other mediums. They’ve even got a Leet Sheet to use as your online cheat sheet. You can also sift through naughty terms like sexting and POS (parent over shoulder) in the Parents’ Checklist, which decodes certain words and phrases for worrisome parents to keep an eye out for in their kids’ chats. In social chat rooms, ASL is a common greeting used by people to establish who they’re talking to. Daters should also know the difference between QT — which means you think someone’s cute — and QX — which means you think someone’s a ninja. Ready to test your knowledge? You can take fun slang quizzes on Slangit with multiple-choice questions asking things like: “Which of the following is an example of a potterhead?” The answer, of course, is C. A devoted fan of Harry Potter. Online daters can use TechTerms to understand how the web works so they can more efficiently and confidently navigate social websites. From affiliate to zone file, TechTerms breaks down internet jargon with clarity and accuracy. From middle schoolers flirting on AIM to adults meeting on dating websites, people of all ages need to know the lingo of the web to clue them in when they’re being wooed. If someone pays you a compliment like “ur the GOAT” (greatest of all time), you probably don’t want to look silly or out of touch by asking the person what they mean — but you can always ask Slangit. 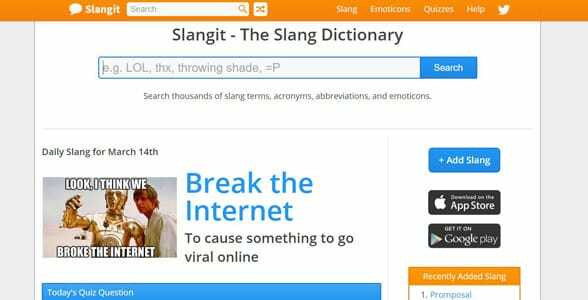 Slangit offers clear definitions of online terms so anyone can learn today’s slang without judgment or hassle. 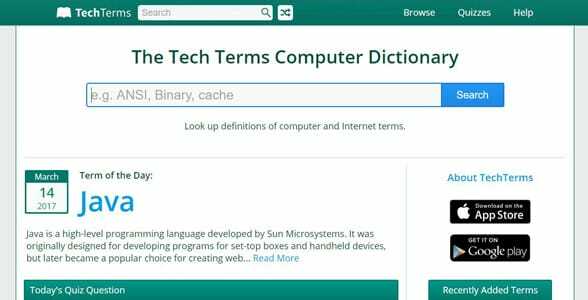 Additionally, TechTerms provides insight into technical jargon that could trip users up. Per is constantly expanding the number of terms in his collection and improving the site’s interface so people can quickly and accurately translate web terminology. These free resources empower online daters to learn the latest lingo on the web. Next time you’re wondering what your crush or your significant other is talking about, try cross-referencing their abbreviations or smileys on Slangit. This straightforward dictionary of slang, emoticons, and other online shorthand keeps you in the know when messaging someone over text, instant message, or social media.